We are happy to welcome Australian artists Tanya Schultz, Nicole Andrijevic and John Kassab to Smiths Row in what is their first major British show. Schultz and Andrijevic have worked in collaboration since 2007 using the alias Pip & Pop and this is their second collaboration with sound artist Kassab. Sweet sweet galaxy is a unique installation depicting an infinite psychedelic landscape. 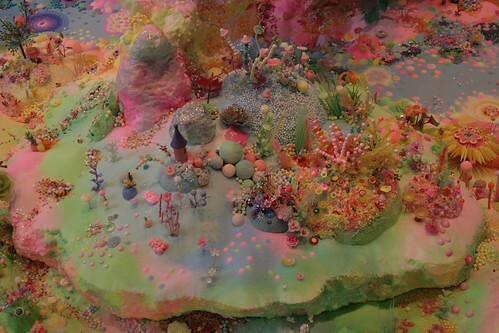 An amalgamation of numerous materials including coloured sugar, fine sand, cake decorations, origami, found objects, LED lights and sound, this colourful sensory kingdom will be constructed directly in the gallery space in early January. The soundscape, created in collaboration with Melbourne-based John Kassab, adds another layer of immersion to the audience experience and sense of being transported to a faraway or imagined place. 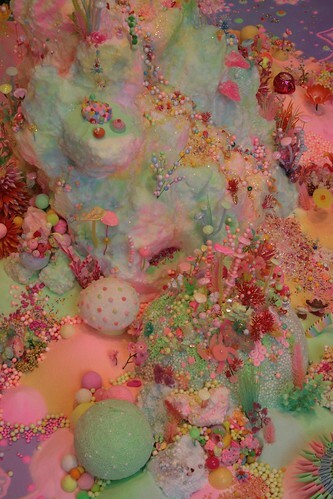 Whilst the soundscape adds to the narrative of the imagined landscape, interpreting the sounds with sugar has been central to Pip & Pop’s process when working with John. The sugar used in this exhibition has been kindly donated by Silverspoon. As the sole producers of homegrown British sugar the company supports 1200 East Anglian beet farmers. According to Dan Gough of Silverspoon: "the sugar used in this exhibition was grown an average of 30 miles away from the gallery". Lavazza – heads for American adv campaign, 2013.